'Bonus Mama' (Ben Hager, R. 1990). Seedling# RE4184Wh#6. TB, 30" (76 cm), Early bloom and reblooom (August-November/California). Standards warm white; falls same, hint of yellow in throat; beards light yellow. Seedling# T3030Wh: ('Ice Sculpture' x 'Geometrics') X 'I Do'. Melrose 1990. 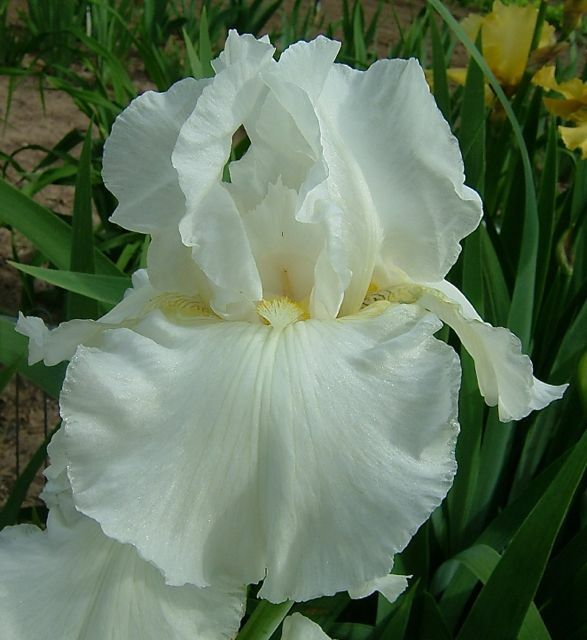 From AIS Bulletin #277 April 1990 Introducing BONUS MAMA (Hager) Wide petaled and fluted white. Short stems, but proving a wonderful parent. (Ice Sculpture x Geometries) X I Do. Early September to frost. BONUS IRIS. Melrose Gardens.